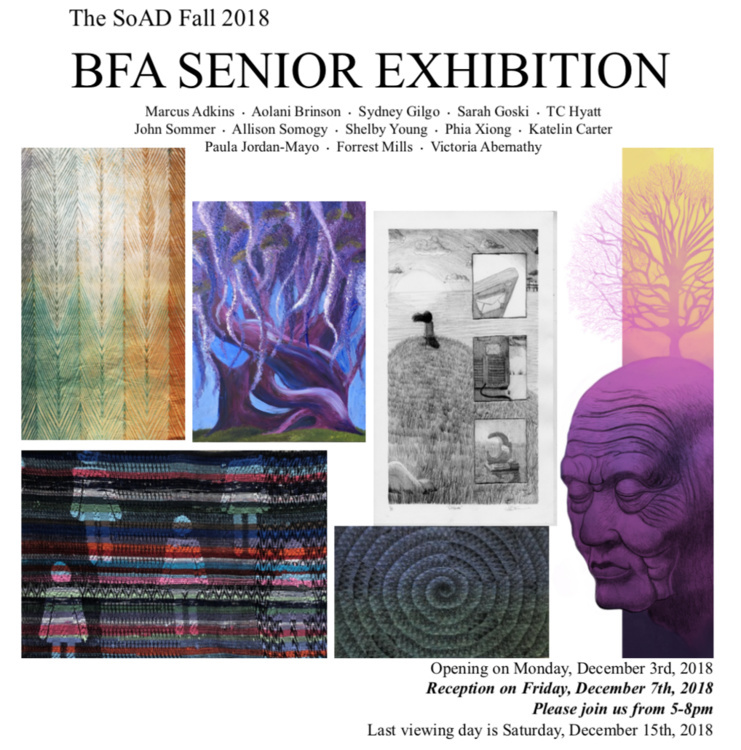 The Gray Gallery is pleased to annouce The SoAD Fall 2018 BFA Senior Exhibition Reception, hosted by the School of Art & Design in both the Gray Gallery and in the Burroughs Wellcome Senior Gallery. Featuring work by Marcus Adkins, Aolani Brinson, Sydney Gilgo, Sarah Goski, TC Hyatt, John Sommer, Allison Somogy, Shelby Young, Phia Xiong, Katelin Carter, Paula Jordan-Mayo, Forrest Mills and Victoria Abernathy. The Burroughs Wellcome Senior Gallery is located in Jenkins Fine Art Center, across from the main office of the School of Art and Design; adjacent to the Gray Gallery. FREE / Open to the public during SoAD gallery hours.